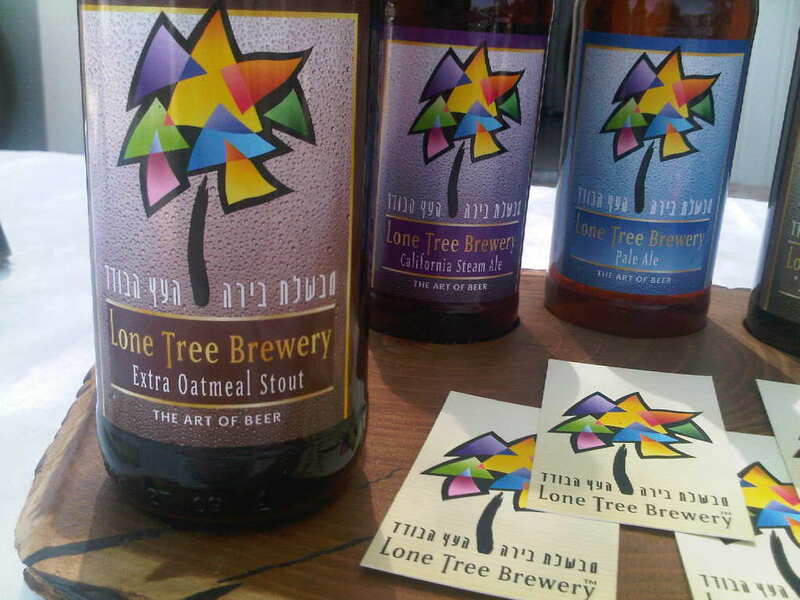 Happy Rosh Chodesh Adar (today is the first day of the Jewish month of Adar. The first day of the month is considered a minor holiday, and there are special prayers, observances and traditions. 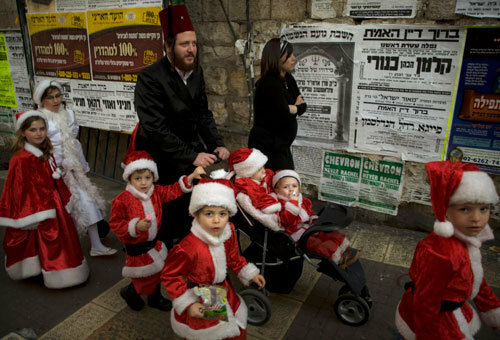 Adar is an especially happy month, since the holiday of Purim takes place in Adar, and Purim is one of my favorite holidays. Think Halloween, Mardi Gras and spring break all rolled into one amazing holiday! 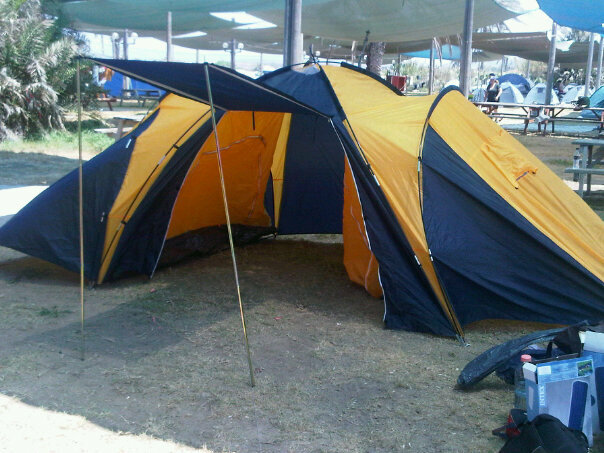 A five star tent -- one common room, two bedrooms, but no kitchen! I really have had an underpriviledged childhood. Tonight will be the first night ever that I will sleep in a tent. Shy-Boy cannot believe that I have lived to the ripe old age of mumble mumble without ever having experienced the sublime nirvana that is tent dwelling. You see, yonks ago when I went camping, we didn’t have tents. 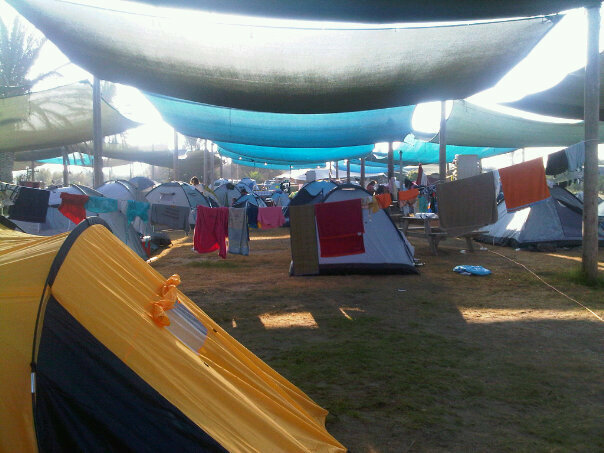 We slumbered in sleeping bags under the trees, in the rain, on desert sands, by the seashore, always under the open sky. 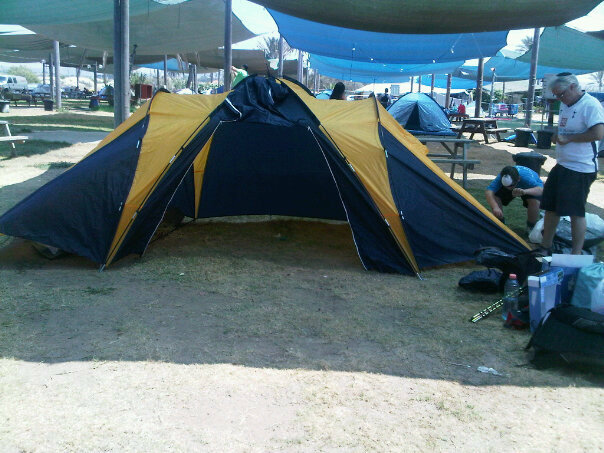 We didn’t have a need for tents, we were roughing it. We cooked over open fires, letting the chicken pieces fall into the mud, the ash, the dirt, and using the Three Second Rule, just tossing the food back on the fire. It was delicious! Ju-Boy and Shy-Boy go camping each summer, leaving me behind in the blissful air-conditioning, watching reruns of House or Doctor Who in wonderful solitude. Tonight I have joined them, because, I have been told, I cannot go through life without roughing it at least once in a tent. You should have heard me earlier today making fun of the Love of My Life and his youngest progeny. 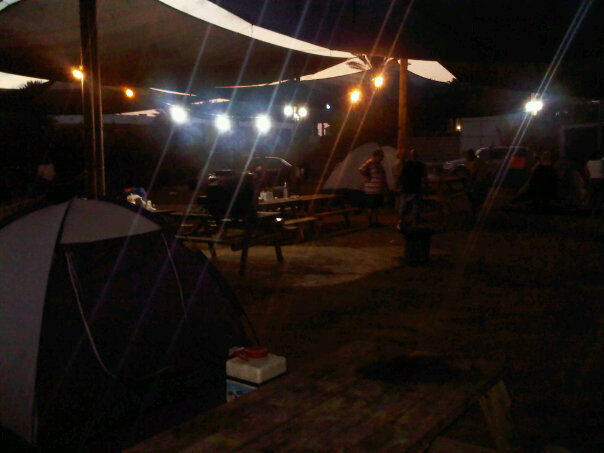 They set up a tent with two bedrooms opening out of a central entranceway. We have blow-up mattresses! We have a portable barbeque! I have brought my BlackBerry to check emails! Shy-Boy is playing games on Ju-Boy’s iPhone while Ju-Boy grills entrecote steaks and is making a salad. No dirt encrusted chicken for the likes of us! With all of this luxury, we are still roughing it. We are the poor neighbors at this campground. The family two tents away have brought a television and home cinema. Another family has brought a generator and a huge chest freezer. 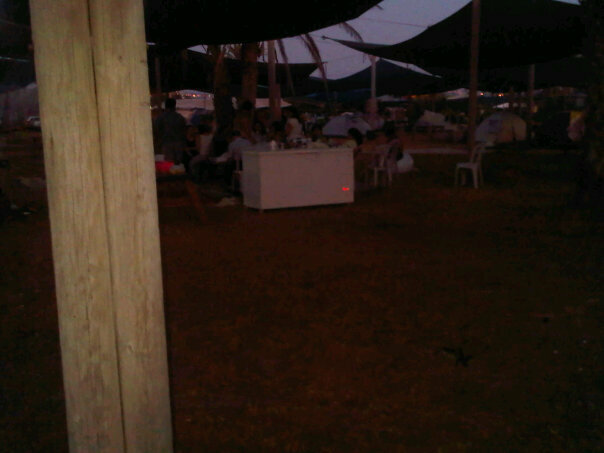 The teens a few meters away are bopping along to Middle Eastern disco on a huge sound system complete with strobe lights. People are cooking spaghetti on electric hobs. A little further away I can see a state-of-the-art plasma television, hooked up to a karaoke machine! 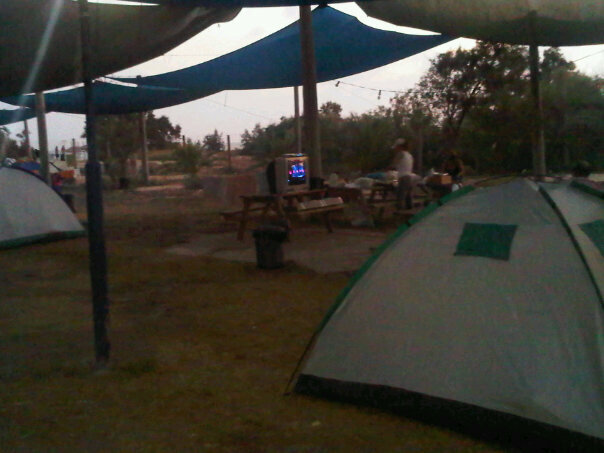 You wouldn’t want to go camping and miss out on who gets eliminated from Kochav Nolad (Israeli Idol). One family shlepped out a huge television and spent the whole night screening their sons' Bar Mitzvah videos, complete with belly dancers and ulalations! Huge chest freezer connected to its own generator -- are they camping out or moving in? Okay, it’s getting dark and as we have neglected to bring a sound and light show with us, scribbling all this down is getting more and more difficult. I suppose I could tap this all into my BlackBerry, but, hey, I’m roughing it! One confession — tonight we’re going to be treated to the Perseids meteor shower, and Shy-Boy has brought his telescope. There is definitely something to be said about smoothing out the rough edges. Shy-Boy made us smoked tuna sandwiches for breakfast! Open the can of tuna, but do not drain the oil. Fold a paper towel into 4 and place on top of the can, pressing down into the oil. Turn and do likewise with the other side, so that the entire paper towel is saturated in tuna oil. 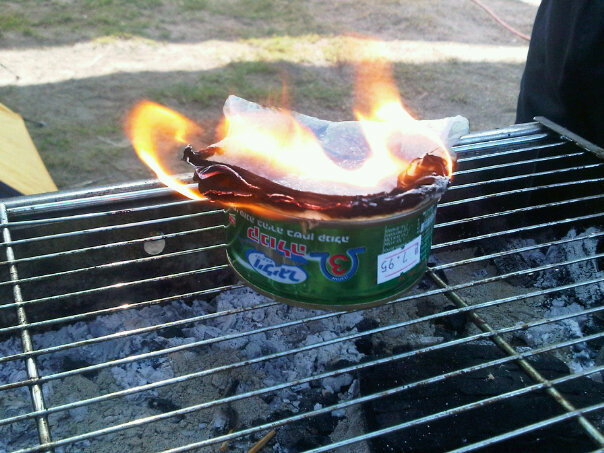 Place the can on a flame-proof surface. Strike the match and ignite the paper towel. Stand back and watch. Take pictures if this is the first time you are doing this and your friends won’t believe what you had for breakfast that morning. Let the flames die down of their own accord. This can take anywhere between 10 and 15 minutes depending on the oil in the can. 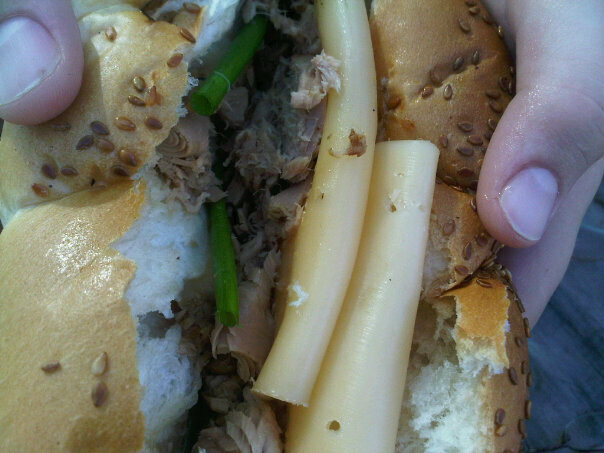 In the meantime, you can prepare a roll with cheese, scallions, whatever you like in your tuna sandwich. No mayo is necessary. 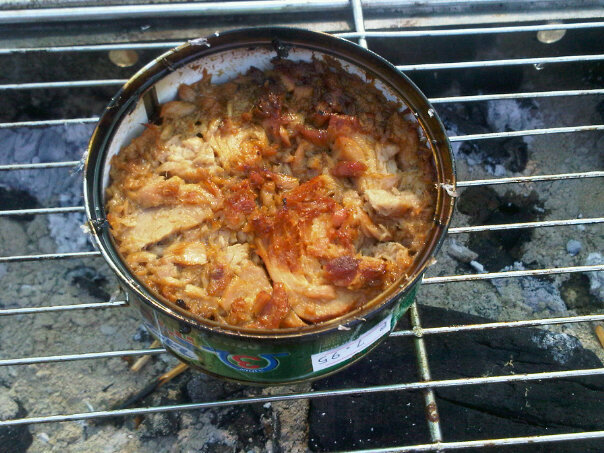 Once the flames have died down, the tuna will be nice and smokey. 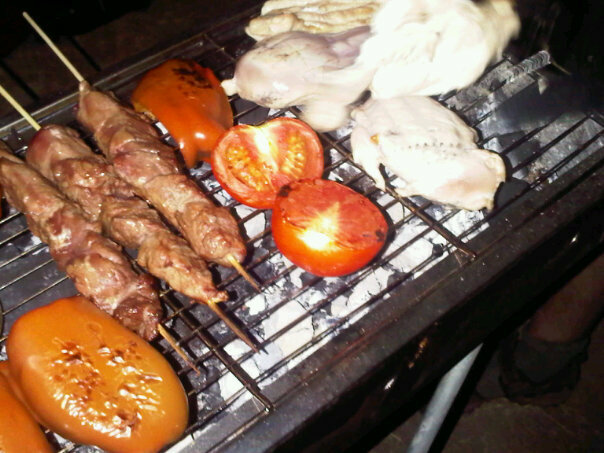 There really is no need for draining now, all the oil has been burned away, leaving behind a wonderful barbequey flavor. Enjoy! Not exactly gourmet, but who needs gourmet when you're roughing it? Delicious! I have always had a love affair with Jerusalem, even before I first came into contact with what is one of the most beloved cities in the world. My first time was at the age of 16. My family was here for the summer to celebrate my brother’s Bar Mitzvah, and my favorite uncle, Abi, rented a car and drove us to Jerusalem, taking us first to the Kotel. My first reaction was very emotional. This wall, for me, is the symbol of how high we have risen, how low we have fallen. In the countless times I have paid a visit to this wall since that bright summer’s day in 1979, my emotional state has wavered between joy and sadness, but those white stones with the tiny bits of paper stuck in the cracks, messages to Hashem, always evokes a tear, an intaking of breath, a special beat to my heart. 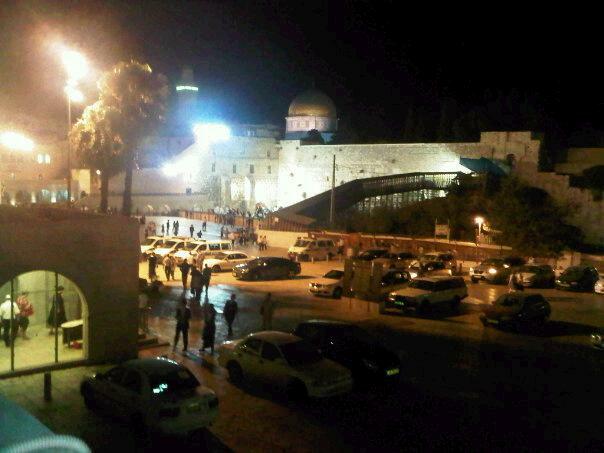 This Monday night we begin the fast of Tisha B’Av, the ninth day of the Hebrew month of Av. This day is the culmination of a three-week period of mourning which began with the fast of 17 Tammuz, the date on which the outer walls of the city of Jerusalem were breached during the siege. On the 9th of Av, the temple was destroyed. My father taught me that this date is the Jewish Friday the 13th, when so many horrible things have befallen the Jewish people. It is the date that the stronghold of Beitar fell to the Romans during the Bar Kochba revolt. It is the date of the expulsion of Jews from Spain in 1492 during the Spanish Inquisition. It is the date when the Nazis began the deportation of the Warsaw Ghetto. Any Jew who feels the collective emotion of our people cannot help but mourn on this day. On Tisha B’Av we fast. In Judaism, the purpose of a fast is to lower the volume on our physical pursuits in order to focus more acutely on our spiritual selves. This doesn’t work for me. I find myself thinking of food. What will I serve to break the fast? How much longer until we break the fast? I find myself drawn to foodie blogs, cookbooks, even the Food Channel on television. I have a one track mind. In my previous life, my girls and I would break the fast on pizza. We would call the local pizza place half an hour before it was time to eat, the pizza would arrive five minutes before the fast was over. I believe that in those five minutes all the agony, the suffering of the Jewish people, was felt. No amount of Bible study, no amount of keening for what once was, could rival the emotions of those last five minutes. It sounds horrible, doesn’t it, that in the last five minutes something as trivial as pizza could cause us to feel the collective suffering of our people. Now that we are living in Chapter Two, we have adopted Ju-Boy’s family traditions (although I believe Shy-Boy would like us to keep with the pizza tradition). We first break with some fresh orange juice, then a cup of tea (with milk, Brit style), together with a piece of cake or a boureka. Only later do we start digging around to find leftovers from the meal we ate before the fast, and whatever else we can find in the kitchen. There is no set dinner for after Tisha B’Av in our house, we become the scavengers our people must have become when the Temple was destroyed. This year I will be home during the day of Tisha B’Av. Normally I am in the office, but there is no office for me this year. I will have no distractions except the worst ones: what will we eat later after the fast is over? I think I am going to occupy myself with cheesecake, I have been told I have a commitment to cheesecake. 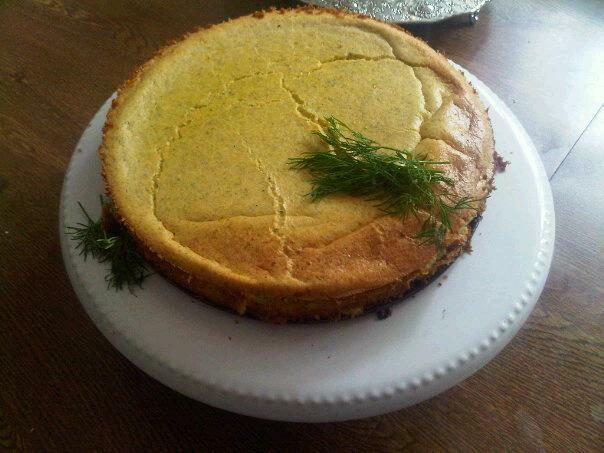 I have one cheesecake in my repetoire that usually makes people cringe, until they taste it — Smoked Salmon Cheesecake. This is not something you serve for dessert, it’s an appetizer, a salmon/cheese pate that, once you get used to the idea, is perfect for a hot summer’s night when you need to break a fast. Have you ever eaten something heavy after not having eaten all day? Horrible feeling, no? That’s why this is a perfect meal for Tuesday night, after we haven’t eaten since the evening before. Try to wrap your head around it. Crush the crackers to fine crumbs. Add the melted butter and then pat into a springform pan. 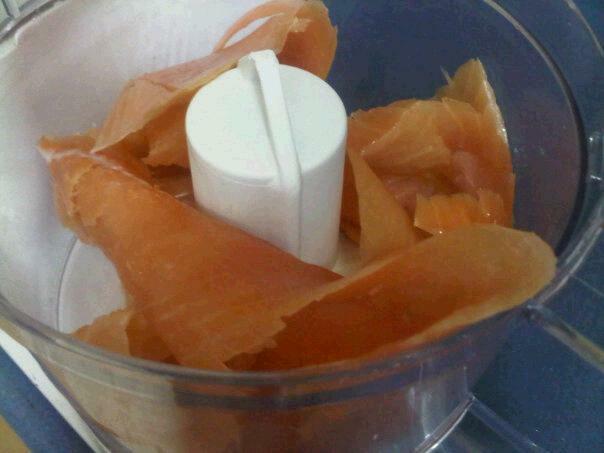 In a food processor, using the steel knife, puree the smoked salmon. It won’t come out like paste, more like salmon granules. Add the dill and give it a whirl until it has reached a spreadable consistency. Place this mixture into a large mixing bowl. Add the cream cheese, eggs and sour cream and mix until all is just combined. Then sprinkle over the flour, salt and pepper. I use a sifter for this so I don’t get clumps of flour. Mix again until all is just combined. You don’t want to incorporate air into the mixture, this will just cause your cheesecake to puff up and crack in the oven. Pour this into the cracker crust. Bake this in the hot oven for 10 minutes only. Then turn the oven down to 110 degrees C (220 F) and bake for another hour. Set a timer! When the timer dings, turn the oven off and let the fishy cheesecake rest in there for another 45 minutes to one hour. Then transfer it to the refrigerator, and let it hang out in there for at least 4 hours. Serve cold, or even at room temperature. It makes a good nighttime snack a few hours later as well. A few years ago my daughter Sassy taught me that it is not the right thing to do to wish someone a good fast. You are meant to suffer. So I wish those of you that will be fasting on Tuesday a צום מועיל (tzom mo’il), a meaningful fast. Thumbelina, what’s the difference if you’re very small? When your heart is full of love, you’re nine feet tall! Once upon a time there was a little girl. A very little girl. When she was born, even though she was full term, she weighed so little that they kept her in the preemie ward. I’d like to say that she grew, but she didn’t. Well, she did, but slowly, s-l-o-w-l-y! By the time she was two years old the local Tipat Chalav (well baby clinic) was threatening to call a social worker and charge me with abuse because they thought I wasn’t feeding her. 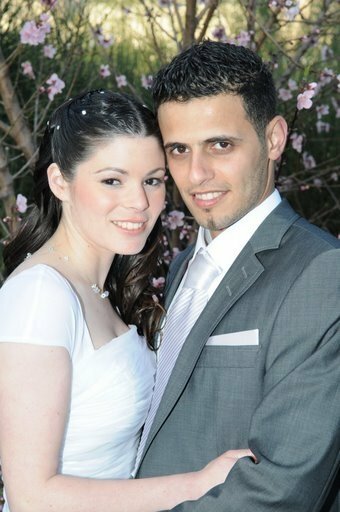 When she was three years old our family doctor became concerned because she wasn’t really gaining any weight. By the time she was four she was the size of a two and a half year old. Tiny little thing. I didn’t even need a stroller for her, I would just carry her around in my pocket. We actually had a wonderful family doctor, who suspected that she might have a growth hormone deficiency (she did). The winter she was four he sent us off to get a bone age x-ray taken, and then on to an endocrinologist. The x-ray clinic was in the same neighborhood as Machaneh Yehuda, Jerusalem’s outdoor market. It was early in the morning and as we got off the bus I thought it would be fun to walk through the market just as it was waking up for the day. Man plans, God laughs. I held Sassy’s hand as we walked through the market. At one point we passed a fish stall. The vendor stuck this huge net into a pool of live fish, scooped up a few, and tossed them on to a stall of ice, the freshest fish of the day. One of the fish did not take too kindly to being removed from his pleasant bath and tossed on to a freezing tableau, and literally leaped (do fish leap?) off the ice and straight on to Sassy. I don’t know what kind of fish it was, but it was HUGE, bigger than my little girl for sure. It hit her full on, and knocked her over on to the cobblestones. To add insult to injury, it lay there on top of her, floundering around, rubbing it’s fishiness all over my tiny baby. She lay on the ground screaming, the fish lay on her, flopping, and I was in so much shock I just watched it all happen in slow motion. Mr. Fish Vendor came out of his shop and removed the insulted fish, hurling it back on the ice. And my Sassy, she just screamed and screamed and screamed. Tiny she was, but she had the lung capacity of an opera diva. Since then, if she knew there was fish on her plate, she never ate it again. Fast-forward 19 years. Sassy has just become engaged to her superhero, Sabraman. It was time for The Dinner. You know, the two sets of parents get together and strategize about the wedding. Sabraman is half Yemenite, half Turkish. Did I cook a meal that was familiar to his parents (something they see on their table everyday)? Or do I showcase my own ethnic background (Hungarian/Lithuanian)? I came up with a third solution. Sabraman, in spite of his boureka-eating, hilbeh-dipping, meaty upbringing, had a thing for lasagne. So I’d make him lasagne. 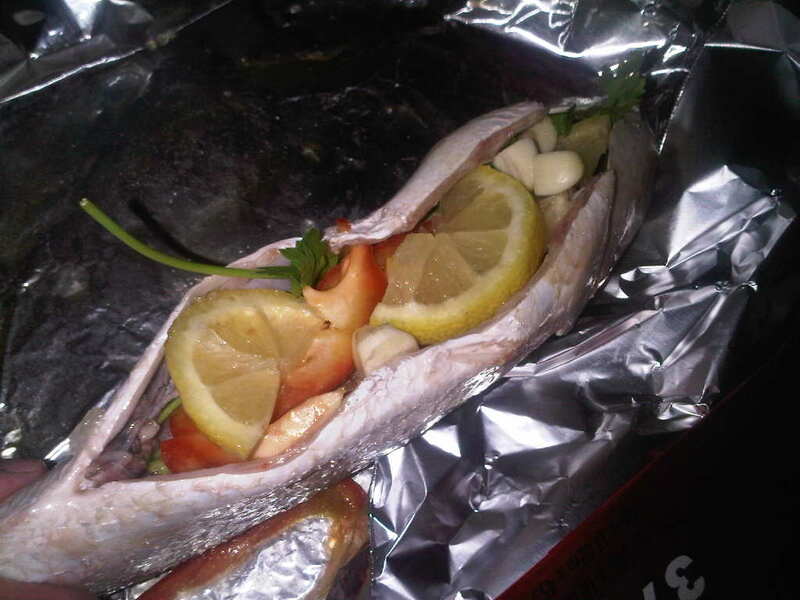 But I thought that would be too outre for his parents, so I made some fish as well. Yes, I know Sassy was going to have a fishy fit at the table, but she behaved herself well, since she’s a fan of my lasagne. So there we sat around the table, the six of us: Mr. and Mrs. Sabraman, the future Mr. and Mrs. Sabraman, and me with my Ju-boy. I proudly served dinner: lasagne, a green salad, a chilled bottle of white wine, and my fishy creation — Hungarian/Thai Salmon. The elder Sabraman couple just sat there and stared. What is this stuff? Is she going to poison us with her Ashkenazi food? It was a tense two minutes or so. Sassy was trying not to stare at the fish, Sabraman was dying to dig in to the lasagne but was waiting for his father to help himself first. Finally, in the awkward, cricket-chirping silence, Sabraman stands up, serves his parents and then his bride-to-be and says in his superhero voice, “It’s good, eat!” And eat they did, they even had seconds. That night, Sabraman was also my hero. Before I post the recipe, just a tiny post-script: Sabraman and Sassy are now living in London, and when I spoke to my daughter last week she said to me, “Here’s an update for your blog, I eat tuna now!” I know this is Sabraman’s doing, he’s my superhero too! I originally posted the recipe on Recipezaar back in 2001, but it’s undergone a change or two since then. Below is as I make it now. While the salmon is still partially frozen, cut into serving pieces. I usually serve this as an appetizer so the pieces are smallish squares. 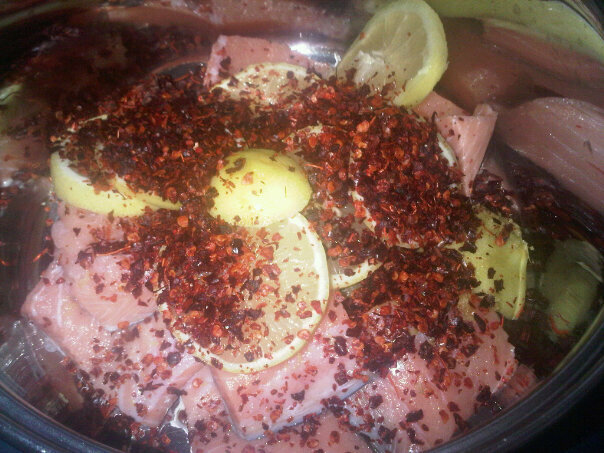 Place the salmon in a large pot and cover with water. Zest the lemon with a Microplane zester and toss the zest into the pot. 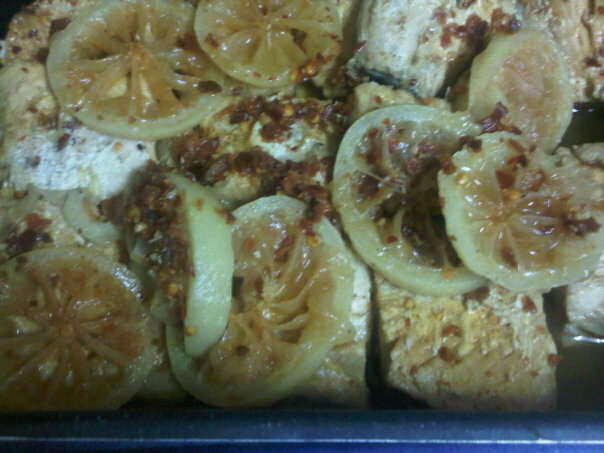 Cut up the balded lemon into approximately 6 slices and toss that into the pot as well. Add the salt and pepper. Bring the whole thing to a rolling boil and let cook for 20 minutes. Yes, I know you are supposed to gently poach salmon, but listen to Miriyummy. Don’t treat the fish delicately, it can take it, don’t worry. Turn off the heat, let sit for about 10 minutes, then remove with a slotted spoon. Chill for at least two hours and serve. Hungarian/Thai Salmon -- perhaps this is next on Sassy's menu? 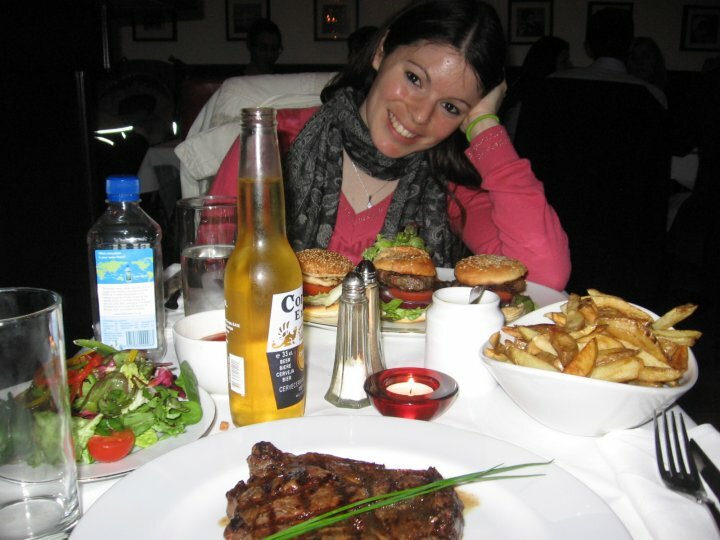 Sassy at a restaurant in London, even her hamburgers are tiny!